People at leading commercial law firm Muckle LLP have spent their Sunday helping a charity in its project to clear and restore ancient woodland. 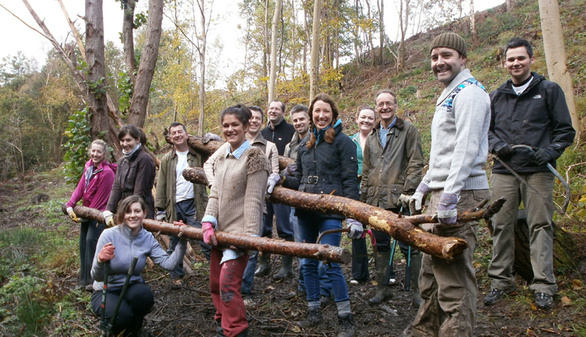 The North East law firm has been a supporter of Shepherds Dene, which is based at Riding Mill in Northumberland, for many years, so when a volunteering opportunity arose to provide a working party to help the charity’s woodland project, Muckle LLP was quick to respond. The charity which provides retreats for groups and individuals of all faiths, received a Forestry Commission grant to remove non-native trees from an area of ancient woodland along the March burn, and to undertake a replanting exercise. Work to fell the non-native pine and Douglas fir trees, had already been done, so 13 volunteers from Muckle LLP concentrated their efforts at the weekend on collecting the old timber and brushwood for a bonfire. Now the space has been cleared, Shepherds Dene can begin replanting the area with 500 trees, including native species of oak, ash rowan, alder and willow trees. Hugh Welch, senior partner at Muckle LLP, who took part, said: “It was reasonably strenuous work on quite rough ground – but it was in beautiful countryside, and everyone enjoyed it. “Our people are always keen to do what we can to help the people and communities where we live and work. This initiative involved people from across the firm. We had people there from our Green Team, which helps to minimise our carbon footprint, as well as from the Community Team, which seeks ways in which we can contribute to society. George Hepburn from Shepherds Dene, said: “This was such a big, physically demanding job – it had defeated us. There were just too many big trees for us to move. That’s when we called on Muckle to help. “They did the work superbly well, with great good humour, giving up their time on a Sunday and they even carried on working in the rain until the job was done.